Manjulatha, 25, died a few months ago while giving birth to her third child. She has left behind a five year old daughter and a two year old son. Manjulatha used to help her husband in his ragi fields and take care of the house also. Her daughter, Anitha is now forced to drop out of school to take care of her younger brother and look after the house while her father works in the field. Manjulatha’s is not the only case of Gollahalli. There are several similar cases in this small village 35 kms from the Silicon city of India. The village is close to the Bangalore-Mysore highway, 17 km from Kengeri and comes under Bangalore Rural District. Girls of the upper primary government school. Many of them will not make it past this level. Pic: Gayathri Vaidyanathan. The village welcomes everyone with its green farms on either side of the narrow muddy lane. Ragi and silkworm farming is the major occupation for the farmers here. Others are employed at construction sites and garment factories along the Bangalore-Mysore Highway. The village has around 250 farming families according to Shivalinga, Bill Collector at the Gollahali Panchayat, with residents living in small huts to big houses. Some of them living in big houses also own grocery and stationery shops in the village. Most farmers and workers do not have TVs or telephones, and depend on the local PCOs. The story of Manjulatha and simultaneously that of her daughter Anitha, is amongst the most common stories of the womenfolk of this village. One of the major reasons is that the village does not have proper gynecological facilities for pregnant women. The issue becomes alarming because the Maternal Mortality Rate (MMR), that is the percentage of women dying during child birth, has increased from 83 deaths per 100 thousand to 94 deaths in Karnataka in 2007. The World Health Organisation (WHO) states that globally there were 5,36,000 deaths during child birth out of which 1,17,000 were from India in the year 2005. Furthermore, the Institute for Research in Medical Statistics (Indian Council for Medical Research) through the report their National Task Force says that Mandya and villages nearby (100kms) have the highest death rate of women during child birth. Gollahalli is in this zone, just 70 kms from Mandya. The report also states that poor living conditions and lack of proper facilities like sanitation and drainage as reasons for the same, the main one being most deliveries are done at home without medical guidance. Girl sitting all alone in the anganwadi. Pic: Supriya Khandekar. Gollahalli has one midwife whom everyone trusts more than the doctors at the Primary Health Center (PHC). Shivamma, who performs deliveries at home has never got any training for performing deliveries and says that she has learnt it from experience. She lives in a one-room hut, her husband works on the ragi farms. Shivamma, a skinny lady with a wrinkled face, is in her forties but looks older. She doesn’t know about any kind of medicines that are supposed to be given to women post-delivery, and none of the doctors or the health visitors have ever visited her to educate her. The PHC has one doctor and two nurses (observation of a week and information from the compounder). The PHC does not take delivery cases as they do not have the necessary equipment, says the compounder. Finding no other alternative, people often come to Shivamma. She explained that the nearest hospital was Rajarajeshwari Hospital, which is approximately 10 kms from the village and a private hospital in Kengeri is 7 kms farther away. Villagers have to depend on only one bus (No 228) for commuting, which had a very low frequency. Shivamma recalls that last year a lady died during child birth as she could not get the vehicle on time and by the time she was brought to her house, she was in bad shape. There were some auto rickshaw owners also in the village who extend their help but it all depends on their availability. Adding to the pain are the bad road conditions. The whole stretch has a kaccha, rocky road, with puddles and pot holes. Gurushidappa is another villager who was seen sitting on the hospital gate with his daughter who was not well. She had been suffering from fever from a few days and was continuously vomiting. She looked weak as she lay on the floor. Gurushidappa, 56, said that many times women have died because of lack of proper care. He also said that there were no government campaigns in the village to make villagers aware of the vegetables or nutritious food necessary for pregnant women, or about the injections, medicines or any other medical care. This board outside the dysfunctional PHC could not be a bigger irony. It talks about the “rights” of the newborn girl child to live in “this beautiful world”. Pic: Supriya Khandekar. Incidently, I met Shobha, a Local Health Visitor at the government PHC. She claimed, “We (Shobha and Rekha, the Junior Health Officer present at the PHC) go from house to house every Thursday and pregnant women are given the TT boosters regularly. The PHC (Gollahalli) takes care of all the deliveries in all the 75 villages that come under it.” On another day, Rekha denied any kind of records of MMR at the PHC. She could not recall when the last delivery was performed. On one of my visits, both Rekha and Shobha left the PHC for the day at 10:30 AM. Also, contrary to the health visitor’s statements that there were two doctors, two health visitors and four nurses available during the working hours, the PHC was empty. There was no doctor or nurse present. The patients said that they were supposed to arrive at 10 AM but came habitually late every day. That day they came at 12. The rooms were vacant and even the shelves looked barren, with only two packed boxes in one corner. But no one other than the peon was available and he had no clue about what the boxes held. While the health visitor was making his claims, Damodaran J, a tailor by profession, said that his wife gave birth to a baby girl in 2007 and took five months to recover, as she was bedridden due to weakness. Damodaran recalls that they only got the initial general check-up done at two months from the PHC and later the doctor told them to go to Vani Vilas Hospital, in Kalasipalyam (near Victoria Hospital), roughly 25 kms from Gollahalli, which they did. Damodar said that going to Vani Vilas every time was very difficult and he was very worried how and what he would do in case of an emergency. He doesn’t even own a vehicle and getting a bus was very difficult. ” The PHC has no facilities for deliveries and they do not perform it here”, he said. They don’t even admit the patients in emergency and there is no ambulance as well. Damodar also revealed that there was no emergency staff and no doctor in the night. The doctor and nurses who were supposed to be on duty until 6 PM left at 3 PM and did not return. Damodar’s wife Pushpalatha, looking pale and thin, said that she did not get even a single medication form the PHC during her pregnancy, apart from two injections. Even the folic acid and iron tablets (which are supposed to be provided free of cost at all PHCs) were not given to her. She had to purchase them from Vani Vilas, she said. Damodar married Pushpalata in 2006. In their twenties, the couple shifted from Kanakpura to Gollahalli after marriage, in pursuit of better business on the advice of a friend. The couple’s neighbour Pushpa added to their complaints. She alleged that the PHC never gave anything for free and the doctor charged money from the villagers. They were not entertained later if they refused. She also said that even for a glucose bottle drip the doctor charged Rs 100 from the villagers. The Senior Health Visitor, Shivkumar though denied these allegations and claimed that the PHC has never taken money from its patients. Still, these claims were backed by other women in the village, including those about the indifference of the government in educating villagers regarding safe delivery as noted by Gurusiddappa. There is another side to this saga. While the non-functional PHC is severely impacting adult women, Golahalli’s villagers are themselves pulling their girls out of school jeopardising their abilities as educated mothers tomorrow. Going back to Manjulatha, her death forced her five year old daughter Anitha to drop out of school and take charge of the house. Anitha’s is not an isolated case. Most girls in Golahalli village drop out from schools soon after they attain puberty,. This is usually between the ages of 11-15, thus not all girls study even till the 10th standard. “Many families poor families don’t even send their girls to the anganwadi”, says Umadevi, a housewife whose two children study in the anganwadi. Moreover a lot of villagers feel that sending their daughters to school will be a loss of manpower in their fields. The count of girls in the anganwadi and the primary school is more than the number of boys. But in higher classes the number of girls reduces. The heads of the schools were reluctant to provide the records mentioning the strength of the school. Though some villagers claimed that all the girls were going to school, even a casual observer would have seen many working at homes, carrying water, carrying bricks and looking after their siblings when parents were out on work. Asha is dressed up for the function as she wonders about her future. Pic: Gayathri Vaidyanathan. Asha, a 13 year old was sitting at home, helping her mother in household chores. She was skipping school for a couple of days as her parents had organised a small function to celebrate her attaining puberty. Asha wants to continue studies till the 10th standard, undeterred by the fact that a lot of girls stopped coming to school after the 7th or 8th standard, or few attended classes regularly. Her parents were happy to allow her to study till 10th but not after that. Asha’s mother Manju reluctantly admitted that she would marry her daughter off after that, just like everybody else. Another girl Shanthi, an eight-year-old, has never been to school. I saw her at a pan shop buying bidi for her father. She works with her mother and even helps her father in construction work. She said that neither she nor her elder sister (now married) had been to a school,going to one, as she was always busy at work. Her parents never told her that she should also study, she added. The village has a few educated women who have never tried to convince other women about the or about the importance of education or health, especially during pregnancy. These literate women say they do not want to educate anyone and in turn invite trouble for themselves. They are scared of the men of their own and other’s families who would like them to be confined to their homes. Yamuna is amongst the very few women who have studied till graduation. She sends her two children (one of them is a girl) to the government school and wants her daughter to be educated like her. The school was providing free meals (rice, sambhar, vegetable), had one teacher for two classes and had good teaching standards. Despite this people were not motivated enough to educate their daughters, or were helpless because of financial reasons, says Yamuna. A rough head count done over a week revealed that the Golahalli upper primary (upto to class V) government school has around 70 girls out of the total strength of 120 students. Headmistress Vasantamma claimed that they had more girls than boys, but refused to show any school records to substantiate her claim. She said that the various facilities provided by the government motivate a lot of villagers to send their children to schools regularly. The school gives free meals, uniforms, and textbooks along with the regular TT and DT vaccinations. Vasanthamma refused to comment on the issue of girls leaving school. And like her, the villagers were generally reluctant to talk openly about their daughters being forced to drop out of school. But the empty benches in Government High school (upto class X) spoke for themselves. 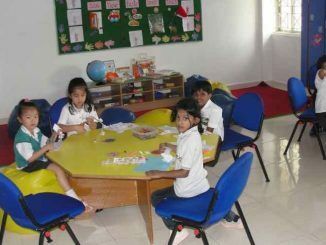 The school is a 10-minute walk from Gollahalli, in a neighbouring village. The primary school is opposite the office and the PHC is a 5-minute walk away. A number of awareness campaigns at the national level talk about the importance of an educated mother. But nothing seems to have reached this part of the country. Gollahalli does not appear to be on the radar screen of Karnataka’s Women and Child Welfare Department. The department sits in the 1st Floor of the M S Building in the city, next to Vikasa Soudha. Being next door to the IT capital of India seems to have been of no help for these women. As more and more girls are pulled out of school each year, they are denied of an education that is their right today, and nipped of their ability to demand for healthcare as a right tomorrow. They are cut out from awareness about health risks they will be exposed to later in life. This may only continue to contribute to the already high MMR in this region. The PHC however looks similar, a lady stops me from entering the PHC and says, “There is no doctor. He is on leave. I don’t know when he will come. You come tomorrow.” After some insisting, a local heath visitor (a public official) allows me to enter but refuses to talk in the absence of the doctor. She points towards the last room where the Shivakumar, Senior Health officer was sitting. On the way there is a general ward where patients are admitted. It has two beds and one middle-aged man is lying on one of the beds with a glucose drip. Ramanna, looks pale and weak as he lies on the bed with the drip. He says he came complaining of high fever three days back, but the doctor was not present and therefore he was put on glucose. He says that the doctor comes just once in a week on Friday. Ramanna’s fever has not been cured and he lies on the bed with the glucose bottle waiting for Friday, when the doctor will come and examine. (I visited on a Saturday). About the pregnancy cases he says that the hospital is unequipped for deliveries. “We do perform normal deliveries here sometimes but most pregnant women are referred to the nearest hospitals [Rajarajeshwari Hospital and Vani Vilas]. No complicated case is dealt with in this PHC,” he adds. However, he adds that there have been only two deliveries performed in the PHC in the last six months. All the others were referred to other hospitals. He also mentions that every Friday a public announcement is made in the villages and all pregnant ladies are called to the PHC to take TT boosters and Folic Acid tablets. He also claims that there have been no deaths in the PHC so far during pregnancy but refuses to show any documents. Another positive change apart from the good roads was that an emergency ambulance is now available for the PHC and can be used by all the 75 villages under its jurisdiction. According to Shivakumar, the state government got Golahalli access to the 108 ambulance service from late 2008. “The ambulance can be called from Kengeri and take around half hour to reach here,” explains Shivakumar. Talking about the staff in hospital, Shivakumar further mentions that everyday one Senior Medical health officer, one health inspector or health visitor and two nurses are present in the hospital. However, on the same day, no one other than Shivakumar and one health visitor was seen in the hospital. Enfold is organising a panel discussion with experts on child safety to discuss the recommended protocols for schools as per the CPP and POCSO Act. The discussion is on November 28th. A uniquely creative collage exibition by G Subramaniam and a nostalgic watercolour exibition by Srividya G S.
Supriya, Extensive investigating report about rural women’s and child health problems. Also glad to hear that you are basically from to Korba city of Chhattisgarh. If you can provide me your e-mail address. I would like to share with Chhattisgarh media about your victory. Excellent reporting Supriya. Such an in depth story. This is a deeply moving article. Everyday we get to hear everything about basics. Basic Education and Basic Health is still a dream for Rural India I guess. Your detailed explanation of events reflects the need, authority, mindset and many other basic aspects. Indian rural health care still more and more painful stories. AlJazeera news network had this video on the Indian Healthcare System: http://www.youtube.com/watch?v=ce7SOdVzgj4 Even that talks about the mindset and the basics. Thanks for posting this wonderfully written article anyway. Great Job! One PHC for 75 villages! An eye-opener by Supriya. This is the stark picture of PHCs all over the state; no doctors/nurses. They collect fees when they are not supposed to and basic generic medicines are never available. Emergencies? one can imagine. Thanks for this article. I do hope Citizen Matters carries more such pieces in the future, on issues that we generally do not see enough of or at all in the mainstream media. Excellent piece of reproting Supriya. The reality is sad, but let’s hope we can do something about it.